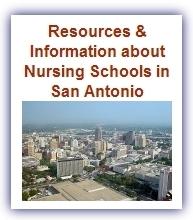 Potential nursing students will be happy to know that there are a handful of accredited nursing schools in San Antonio to choose from. Depending on your career and education goals, students looking to stay in the San Antonio area should have no problem finding an LVN (Licensed Vocational Nurse) or RN (Registered Nurse) program that fits their needs. In this article we will break down the different San Antonio nursing schools available by which type of programs or degrees they offer. This four-year school offers several degree programs for students to choose from. When it comes to nursing education, their School of Nursing and Health Professions offers three main programs. They are a Bachelor of Science in Nursing (BSN), Registered Nurse to Bachelor of Science in Nursing (RN-BSN) and a Master of Science in Nursing (MSN). The University of the Incarnate Word’s Bachelor of Science in Nursing Degree requires that individuals complete the following prerequisite courses: anatomy, nutrition, psychology, statistics, chemistry and microbiology. After which, they can apply to the program. In all, the program is five semesters. In each student’s senior year, they will be required to complete a hospital or medical clinic internship. Upon completing the requirements for a BSN at University of Incarnate Word, individuals will be able to sit for the National Council Licensure examination for Registered Nurses (NCLEX-RN). The RN-BSN Bachelor of Science in Nursing Program is for individuals who have already earned an Associate’s degree and who are working as Registered Nurses. All classes are scheduled in the evenings, making it possible for individuals to continue working while attending school. A Master of Science in Nursing program is another option for students. In order to be accepted into this program, individuals have to had to completed their BSN and be working as a nurse. Individuals can enroll as either full-time or part-time students. It is possible to specialize and students are given the option of choosing the specific population they would like to serve, for instance, the elderly. The University of Texas Health Science Center consistantly ranks as one of the best nursing schools in Texas. Their nursing program offers both Bachelor and Master-level degrees. The San Antonio nursing school’s bachelor program offers two tracks, traditional and advanced. The traditional one is for students who have yet to earn a Bachelor’s degree in any subject. The advanced track is for those that have at least earned one. Regardless of what track a person decides to take, they will be taught what they need to know to successfully sit for the NCLEX-RN, though there are no guarantees given that they will pass. Master of Science in Nursing degrees can be earned in the following majors: Clinical nurse leader, family, acute care, family psychiatric mental health and pediatric. In order to enroll in this program, individuals must have a Bachelor’s degree or diploma. A full-time student can typically complete the program in two years. A person that is only enrolled part-time will typically need about five years to complete the program. Individuals can also obtain their Doctor of Philosophy in Nursing at The University of Texas Health Science Center. Students don’t have to have a Bachelor’s degree to be accepted into the program. In closing, San Antonio has several education options available for students looking to pursue a career in nursing at any level. After you establish what your education goals are, the next step is to get in contact with the nursing schools in San Antonio that fit your needs to find out more information about their programs.